That sets a pretty high bar for the Droid 2, and if you read our review roundup, you already know that most other bloggers thought that, while it is certainly a worthy successor to the most popular Android phone ever, it doesn’t raise the bar or set a new standard for Droids going forward. Overall, I can’t say I disagree, though there are a few things I don't think the other reviewers hit all the right keys on. What are those things? Read on for the full Android Police review, which does hit all the right keys. As you can see, the Droid 2’s specs aren't as mind-blowing today as they would have been a year ago or perhaps even six months ago, but, more often than not, specs tell only half the story, and the Droid 2's still aren't exactly obsolete. So how's the design? Well, on the front of the Droid 2, you'll find the standard array of buttons: menu, home, back, and search, in that order, from left to right. 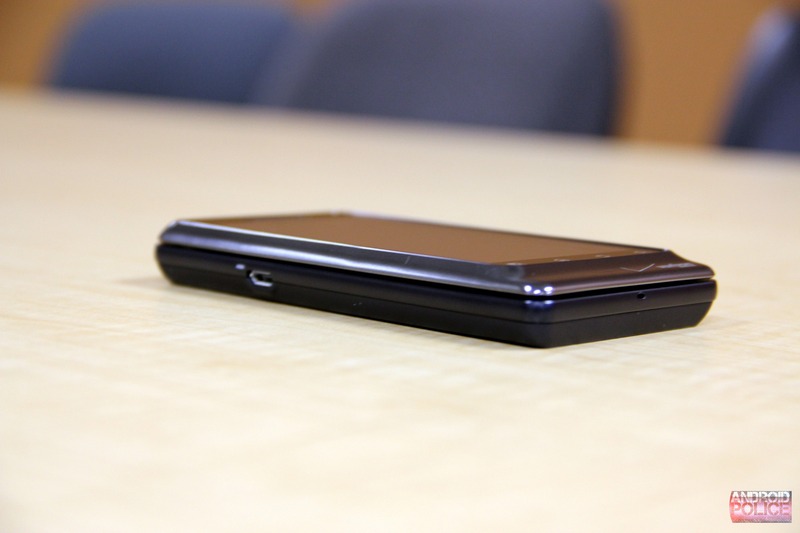 It's nice that they didn't change the layout from the Droid X, but if you're coming from the original Droid, it might take a while to get used to having all the buttons rearranged (except the search button, which is still the last button on the left). Above those four capacitive buttons, you’ll find the main attraction in this theme park, the 3.7 inch, 854x480 LCD display (more on that later), on top of which sits the Motorola logo and the speaker. Speaking of logos, that little notch on the bottom of the original Droid that never seemed to serve any significant purpose, other than to hold the Verizon logo, is still present and looking worse than ever. Whereas on the original Droid, the little bar at the bottom was, if nothing else, themed out to match the rest of the device, the corresponding bar on the Droid 2 is part of a strange chrome bezel that wraps around the edges of the phone and frequently distracts you from the content on the display. This may not sound like a major issue, but if you take into consideration the fact that the bar drastically increases the device's overall footprint, it's definitely an issue that should be addressed in the next revision. The chrome bezel isn't the only new color scheme Motorola's trying with the Droid 2; the entire back plate is now colored blue. It’s not as noticeable in person as it looks in some of the pictures, and personally, I don't really mind it since I almost never look at my phone's rear side anyway, but it certainly doesn't look as nice as the back of, say, an EVO 4G or the Nexus One. Of course, looks aren't everything, so let's see what Motorola's decided to put on the back: a few more logos and the 5MP camera with a dual-LED flash (another thing I'll touch on later). The rather bulky sides of the device contain the volume rocker, a physical camera key (all on the right side), and the microUSB port on the left side, which is complimented by an LED light of its very own - nice touch. Minor details aside, the main improvement Motorola's made is the keyboard, and it really is a huge step up from the original Droid. Whereas on the Droid 1, the keyboard was completely flat, the Droid 2 now features ever-so-slightly domed keys. They're still not very easy to press down on, there's still no home, menu, or back button (although there are search and a speech-to-text buttons), and my personal preference is for separated keys, but they're still going to feel like heaven to someone who has spent the last few months of their life living with the keyboard of the original Droid. And besides, that sliding mechanism, which has not been changed from the original Droid, is good exercise for your thumbs! Another thing that hasn't changed is that 3.7 inch 854x480 LCD display, and I can't say I'm disappointed. Sure, it's a good deal smaller than the display on most other modern Android smartphones, like the Droid X or the EVO 4G, but there's no two ways about it: it's gorgeous. Everything from pictures to text to videos looked crystal clear and I couldn't make out the individual pixels unless I held it about an inch away from my eye. In fact, I was able to read the text on most desktop-intended sites without zooming in at all, which definitely says something about the sharpness of the display (which chimes in at 264.77 PPI, to be exact). 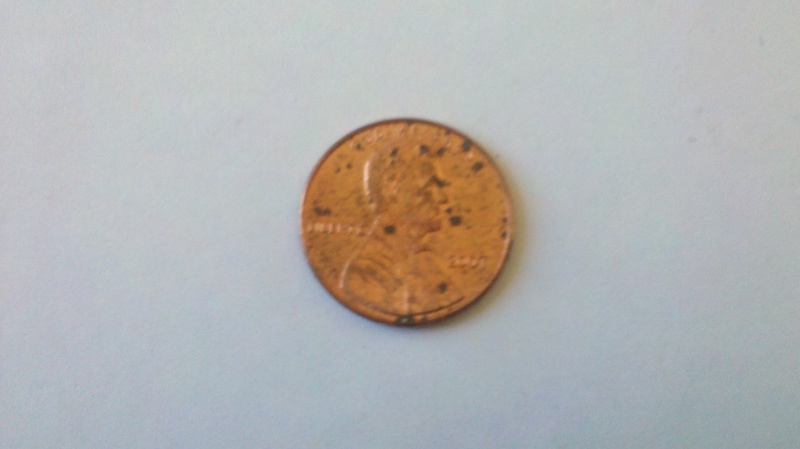 One thing that isn't sharp enough is the 5MP camera. It has not been changed from the original Droid and was considered mediocre even at the time of its release. 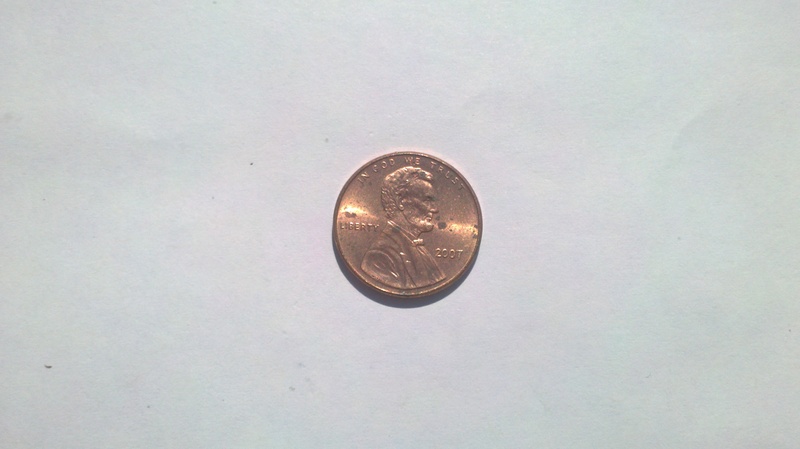 As you can see from the image above, the Droid 2's camera quality in average lighting conditions is not just bad; it's downright unacceptable for 2010. Naturally, the situation improves when there's more light available, but that's something true of every camera and therefore not an advantage. In low light, it's actually not that bad. The flash is a tad too green for my tastes, but, at least for a camera phone, the low-light images are pretty decent. Video quality is also disappointing; for some mysterious reason known only to Motorola, the Droid 2's maximum resolution for video is 720x480, which is more than a little underwhelming, especially considering that the iPhone 4, EVO 4G, Galaxy S, and other recent phones can record video at 1280x720 (720p). Not only is the video low resolution, it comes out looking ridiculously grainy, and for the first five or so seconds, there is a high whiny sound. But hey - at least the camera app (which will be covered in detail in the "Software Overview" section below) is decent. 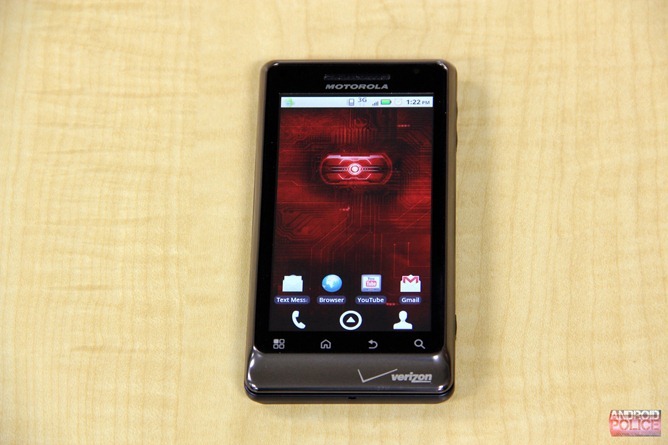 When I first heard about the Droid 2, my first thought about it was, "Finally! A phone that launches with FroYo!" 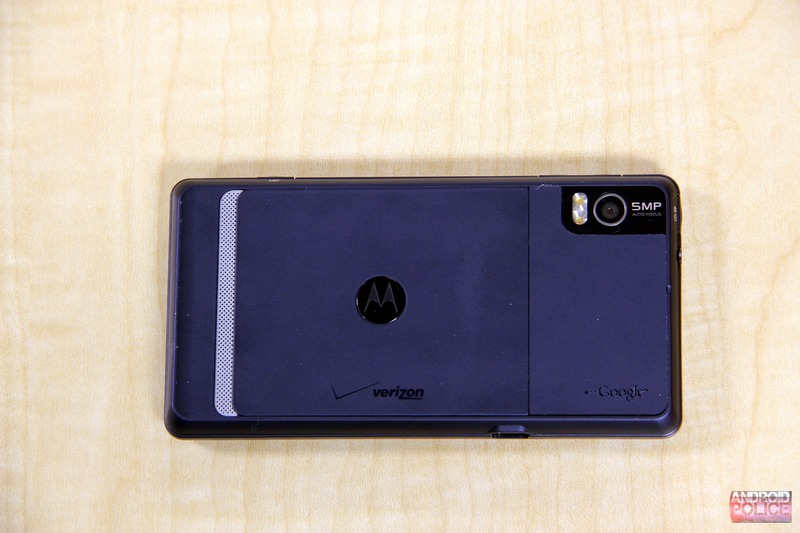 However, my initial excitement was hampered when I learned that it would be coming with the same skin Motorola implemented on the Droid X. After all, one of the best things about the original Droid was that it came with stock Android 2.0 (the newest release of Android at that time) rather than MotoBlur. This allowed for quicker updates as well as enhanced speed and compatibility. Alas, it appears that in the future, all phones will be running some questionable skin implemented by the manufacturers, which typically ends up slowing OS upgrades as the hardware manufactures work to port their skin to new Android revisions. Perhaps Gingerbread will address this but I have my doubts. In case you aren't familiar with the Droid X's skin, let me give you a brief overview: like all versions of Android (1.5 or 2.2, skinned or unskinned), you have a homescreen (this skin allows for seven panels, no fewer and no more) on which you can place all your favorite widgets, apps, and other shortcuts. Unfortunately, the more widgets you place on it, the slower it becomes, so therefore, it is a huge(-ish) problem that the phone has all seven of its homescreens filled up with widgets that you most likely won't ever need, like, or use when you first boot it up. The whole ridiculous ordeal forced me to spend my first five minutes with the device deleting widgets. Furthermore, not only are most of the widgets useless, they're incredibly ugly. Whereas HTC's Sense provides nice, slick widgets for mail, calendar, etc., Motorola provides flat blue, green, and red bars containing minimal information but (by default) taking up maximum space, though you can resize the widgets if you like. Ah yes, that brings me to the next point: the resizing and moving around of widgets. No, you can't resize them any way you like (for example, the messaging widget can't be made to occupy the entire screen), but it's still helpful to be able to just long press a widget, let go, and drag the corner to switch between different sizes of it (again, not all sizes are available for all widgets). Perhaps better thought out is the way you can move apps and widgets around in the skin. In stock Android, Android with Sense, and just about any other version of Android I can think of, there is no way to make apps (or widgets, for that matter) switch places; instead, you have to delete the app (or widget) you want to replace from your homescreen or move it to another panel before dragging the new app/widget in. It sounds confusing and not all that useful, but being able to just drag an app or widget onto another app or widget and have them automatically switch places on the homescreen is actually really convenient in real life. Motorola was kind enough to include a multitouch software keyboard, which makes typing a hell of a lot easier since it doesn't have problems registering two letters being pressed down at the same time. 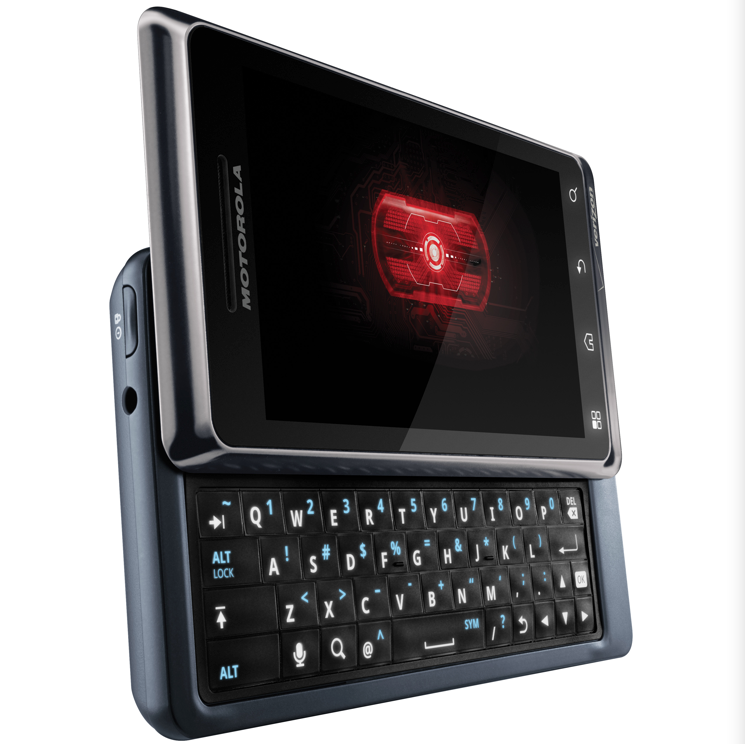 It also comes pre-loaded with Swype, which improves the on-screen typing experience. 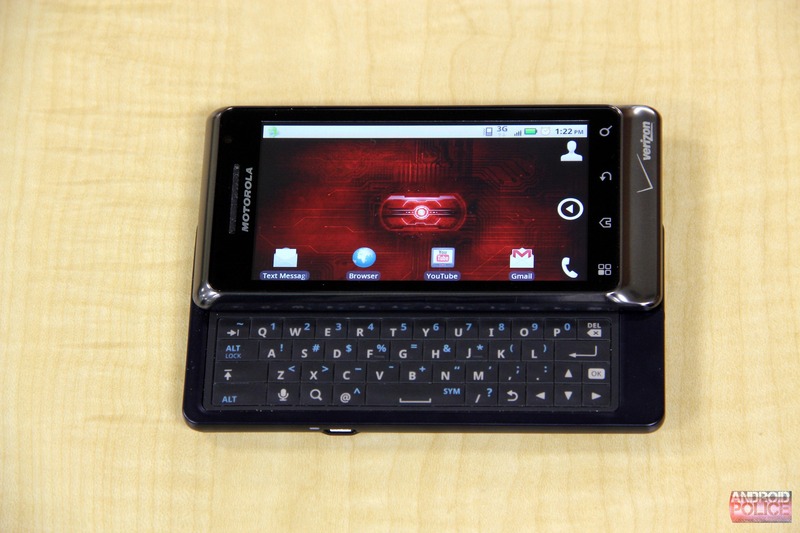 Of course, should you desire, you always have the ability to download third-party keyboards from the Market as well as the Internet, though it’s likely that most Droid 2 buyers won't even notice the virtual keyboards since they have the physical one at their disposal anyway. Onto the part of the skin that I liked the least on the Droid X: the camera app. 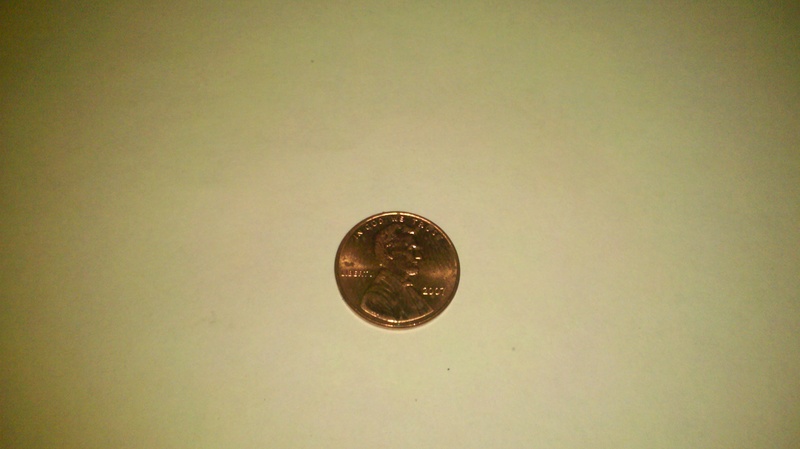 On the Droid X, the camera app was so slow that, as Gizmodo put it, "'Is it being slow, or did it not register?' is a popular game." The fact that it forced you to press the rather stiff camera button in order to take a picture meant about twice as many blurry shots as well. Beyond that, the UI was frustrating and slow to use. Well, I'm happy to report that in this newer version of the skin, the camera app has been given a (slight) makeover. It still takes an annoyingly long time to open (certainly long enough to play the guessing game suggested by Gizmodo), but at least now there's a button you can press to take the picture, so it's not as easy to shake the phone while snapping a shot, resulting in less blurry results (generally speaking). The UI hasn't been changed much, but at least you still get a ton of effects to choose from (normal, black and white, negative, sepia, solarize, red tint, green tint, and blue tint) as well as a few scenes (auto, portrait, landscape, sport, night portrait, sunset, macro, and steady shot). Another improvement over the Droid X is the Gallery app. On the Droid X, the Gallery is a boring, black, flat menu. Now, with the Droid 2, you get a nice, blue-tinted gallery app that gives you thumbnails of the pictures that are in it. It's really cool and fun to use, but to be honest, the experience is not unlike that of stock Android, so I'm not sure why they bothered modifying the Gallery app in the first place. Despite all those changes, it's still Android 2.2 underneath. That means you still get the staple Android features, like turn-by-turn navigation, the notifications shade, Adobe Flash 10.1, and everything else we Android users have come to know and love. Despite the fact that the Droid 2 has an amazingly powerful processor under the hood (1GHz TI OMAP 3630), it only got a score of 14.377 MFLOPS from Linpack. This is disappointing, since the EVO 4G, even with its supposedly inferior Snapdragon processor, consistently got scores of around 33 or so MFLOPS. That's not to say that in daily usage the Droid 2 will feel slow; it won't. Apps (excluding the camera app, of course) opened with little to no lag, even the most heavy of web pages loaded in under 10 seconds, and the smartphone generally felt snappy. While its performance may be merely on par with the competition, the Droid 2 is head and shoulders above when it comes to battery life. In a test where it was forced to repeatedly play a YouTube video (Google's recording of I/O 2010, if you must know) over 3G with screen brightness cranked up all the way until the battery drained, it lasted no less than four hours and fifteen minutes. By comparison, the Droid Incredible died out a full hour earlier, and even the mighty Droid X was fifteen minutes short of the Droid 2. If you want an Android road warrior, this is it. Finally, call quality was impressive, as has become the norm for Verizon phones, especially ones with dual microphones for noise cancellation (although Verizon and Motorola have not confirmed this, iFixit's teardown of the device has). Data performance was equally impressive, even when in remote locations like the middle of a forest or in a valley surrounded by mountains. Unlike some other reviewers, I didn't experience the deathgrip issue; no matter which way I held the phone, I couldn't get it to drop bars. The Droid 2 is a good phone - a great phone even - but I highly doubt it's going to get nearly as much attention as the phone it succeeds. 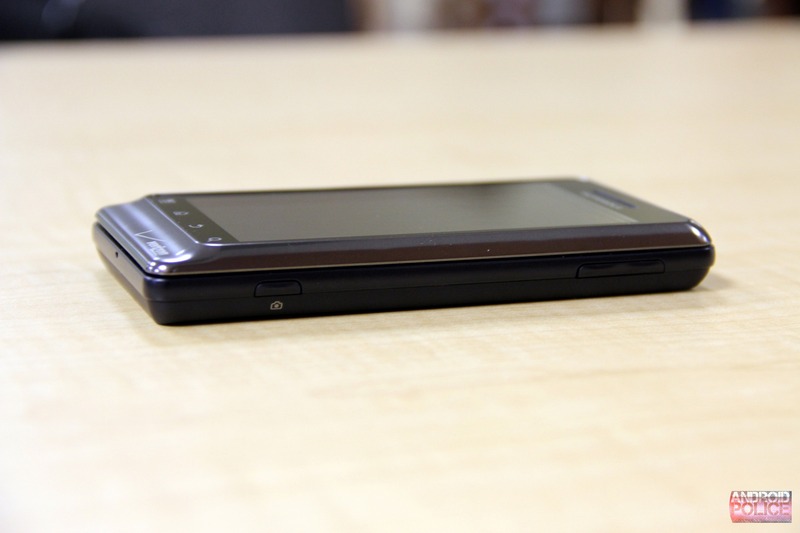 Don't get me wrong, the 3.7 inch WVGA display is gorgeous, but I doubt anyone in the store will even notice it after seeing the Droid 2's 4.3 inch counterpart, the Droid X. 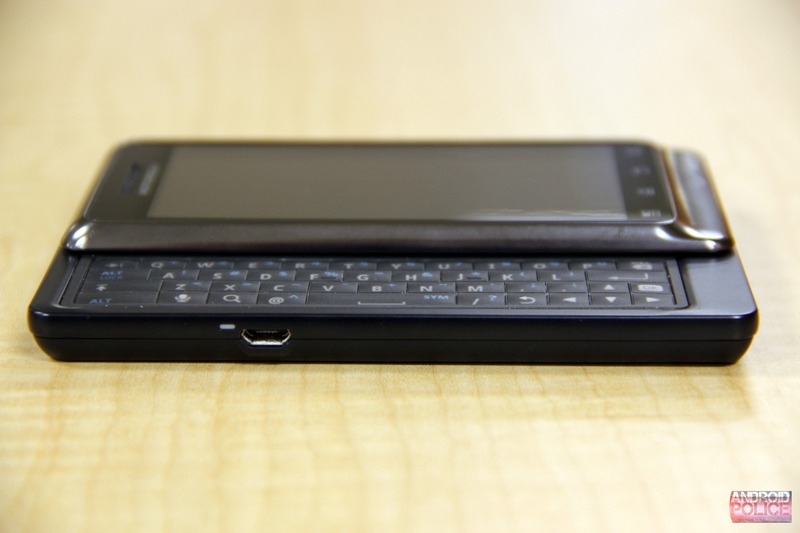 Its keyboard, while a huge improvement over the original Droid, is still nothing to write home about. The fact that it's launching with FroYo is awesome, but perhaps it isn't as huge an advantage as some may believe, since the original Droid as well as the Droid X and Droid Incredible are scheduled to get it soon. 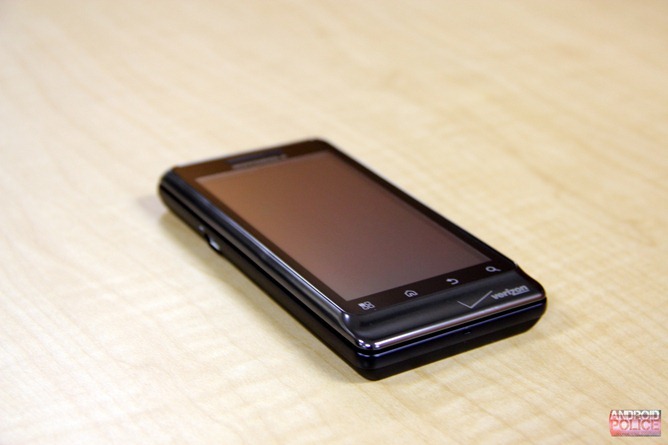 The truth is, the original Droid was not only Verizon's flagship device, it was the best Android phone on the market with no competition (at the time of its release, that is). 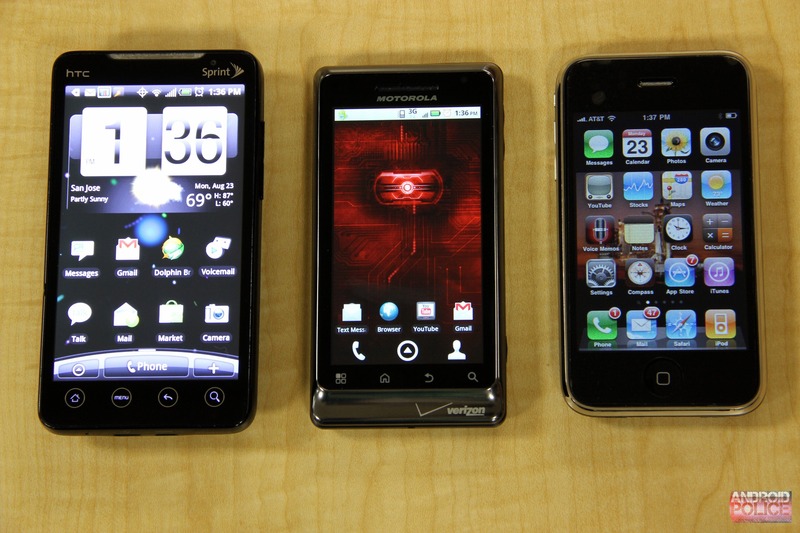 The Droid 2, while nothing to scoff at, shows no signs of being superior to Motorola and Verizon's own Droid X, or even the Droid Incredible. 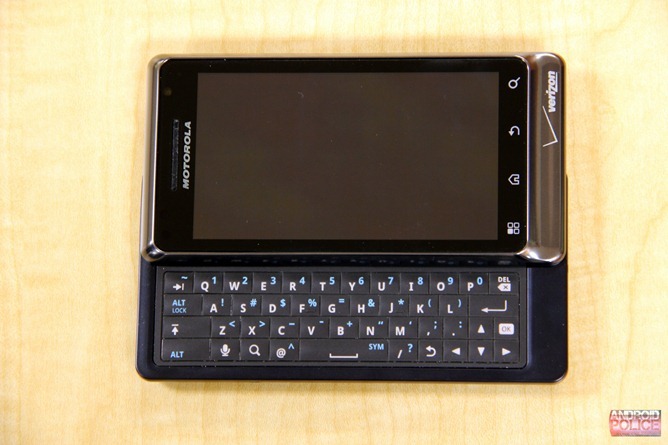 So unless you're convinced you need a full-fledged physical QWERTY, I'd recommend picking up one of the other Verizon's Droid offerings, especially since all three cost the same, both monthly and upfront. Still, I like the Droid 2 for what it is: a sequel to the original Droid that adds a touch of paint here, a streak there, but doesn't do a complete paint job.